When tasting wine, the most important thing to remember is that there is no textbook answer to the question, “Is this a good bottle of wine?” There are definitely ways to improve the quality and taste of wine, making some bottles more likable, but keep in mind that everyone has different tastes and and will enjoy different types of wine. The best way to find out what you like is to keep tasting. Don’t be intimidated to try something new! 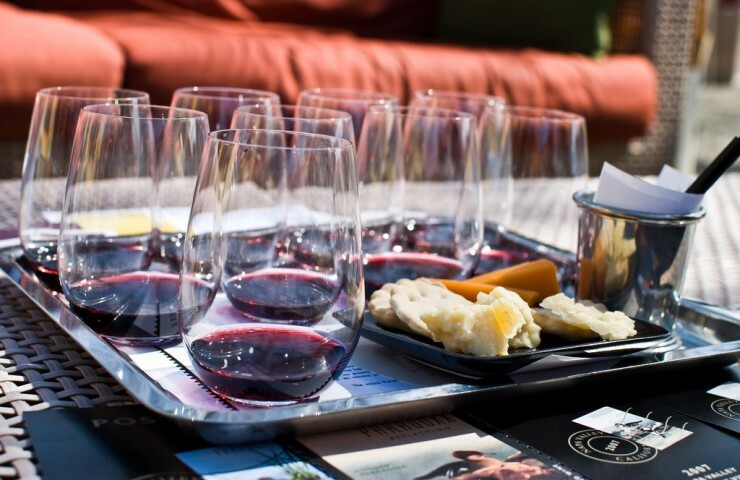 One great way to learn more about wine is to increase your wine education. 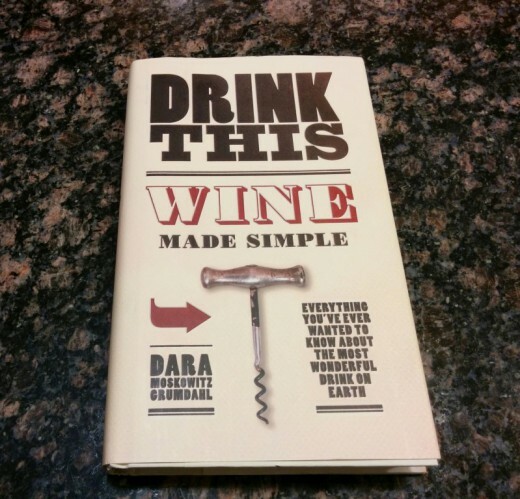 I particularly enjoyed the book Drink This: Wine Made Simple by Dara Moskowitz Grumdahl, a Minneapolis-based food and wine writer. Dara provides great information on different varietals, grapes, and the regions from where they originate, and also has great advice on wine tasting and purchasing wine from your local shop. Whether you want to gain more confidence when buying wine or ordering wine at a restaurant, or just want to know more about wine in general, check our her book. It’s a great starting place to broaden your knowledge on wine. 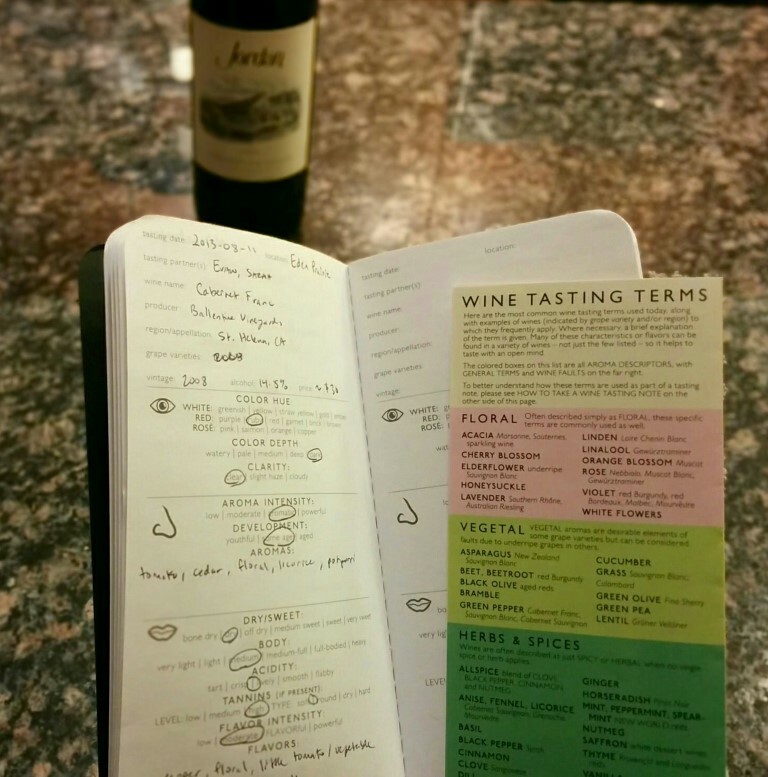 When my husband and I first started trying new wines, we purchased a wine tasting book that guided us through the process and allowed us to take notes while we tasted. To help get you started, I’ll walk you through a typical tasting we do and explain what we take notes on and what we look for in a bottle. 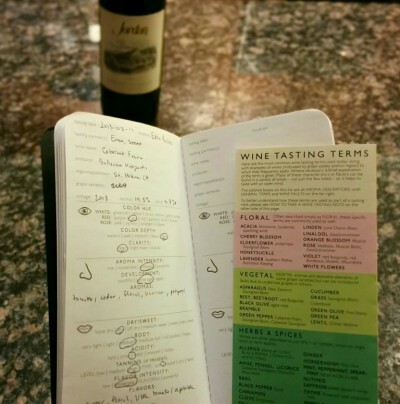 I recommend taking notes during your wine analysis; it will be helpful when you’re trying to remember if you loved that 2009 Alexander Valley Cabernet that’s on sale this week. Red and white wines have different recommended serving temperatures, which are very often not followed correctly. Maybe you’ve heard that you should only hold a wine glass by the stem and avoid touching the glass itself – the reason for that is because of temperature. Touching the glass transfers heat from your body to the wine, causing an increase in wine temperature and therefore can affect the taste of the wine. Check out my article on ideal serving temperatures to learn more about the correct temperatures to serve your white and red wines. In addition to serving wine at the correct temperature, try to let the wine breathe in a decanter for 20 to 30 minutes before you begin. Otherwise, you can use a wine pour spout with a built-in aerator, so the wine aerates as you pour. Once your wine is poured, start by analyzing the appearance. More specifically, look closely at the color; if it’s a red wine, is it ruby, garnet, brick, purple? If it’s white, is the color greenish, yellow, gold or amber? What is the intensity or depth of the color? In other words, does the wine look watery or deep in color or somewhere in between? This characteristic provides some insight on the age of wine. 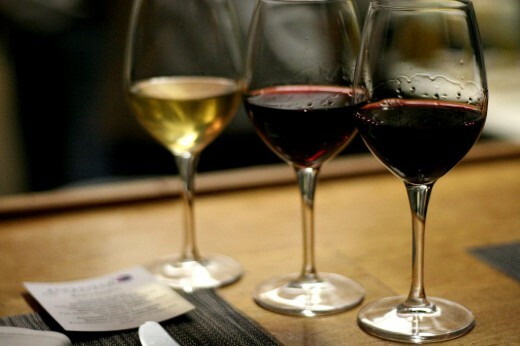 Typically, red wines get lighter as they age, but white wines get darker in color. Observe the clarity of the wine. Hold the glass up next to a white background to help with this. Is it clear or cloudy? Cloudiness in wine can sometimes indicate it has gone bad; however, keep in mind that some wines are unfiltered and a slight haze is normal. Swirl the wine in the glass. Does the wine coat the sides of the glass and slowly streak down the sides, like the glass on the far right in the picture? If so, it’s said that the wine “has legs”, which means the wine has a high alcohol content. The reason for this stems from Physics and basic principles of surface tension of liquids. Without getting too technical, legs are caused by different surface tensions and evaporation rates of water and alcohol, the two main components of wine. After evaluating the appearance, we move onto the aroma and smell of the wine. Swirl the wine in your glass to release the aromas above the surface of the wine and immediately stick your nose slightly inside the glass and breathe in. Some people I’ve met prefer to keep their nose outside and just above the glass when smelling, but I’ve found you’re able to get a more intense aroma if you smell from the glass. After smelling the wine, consider how powerful the aroma was. Sometimes you’ll get a powerful aroma from a wine (your nose will feel like it’s “full of aroma”), while other wines may provide a low to moderate aroma. One way to help with this analysis is to note how close you had to bring your nose to the glass before you started appreciating the full aroma of the wine. The smell of wine can also provide some information about the age of the wine. Typically, younger wines resemble the fragrance of the original grape, while aged wines take on a more complex and mature aroma. For example, an older red wine can provide hints of leather or tobacco. Smelling wine and identifying what you smell can be extremely challenging, but the more practice you have, the easier it becomes. I often smell something familiar but I can’t quite determine what it is, even though it may be something basic. If this happens to you, one thing that could be helpful is setting out small containers of “known smells”. For example, if you’re tasting a Pinot Grigio, you can typically expect it to have hints of pear and citrus. Place a few pear slices and lemon slices into a bowl so you can easily remind yourself of those scents and compare them to the smell of the wine. It might help you pinpoint certain aromas you get from the wine. The two charts below show common aromas and flavors in both red and white wines. 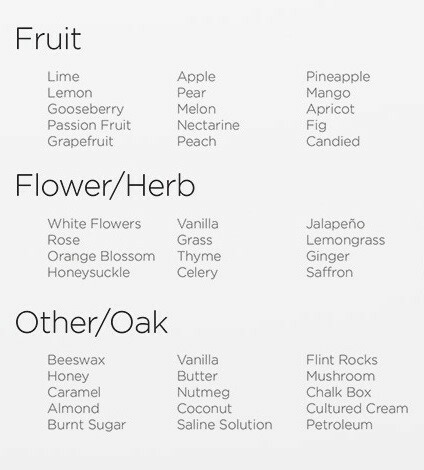 Use them as guides as you’re smelling to help pinpoint aromas. Try to determine if the wine is dry or sweet or somewhere in between (called “semi-dry” or “off-dry”). During fermentation, sugar in the grapes converts to alcohol. If a wine is classified as dry, it means that all of the grape sugars have converted to alcohol during fermentation. If a wine is sweeter, it means it hasn’t fully converted and residual sugars remain. Here’s a good technique to help you identify the body of a wine: imagine the weight of water on your tongue, then compare that to the weight of wine on your tongue. If the wine feels heavier than the weight of water on your tongue, the wine is known as “full bodied”. If it feels lighter than water on your tongue, it is “light bodied”. We also want to determine the level of tannins present in the wine. Tannins are present in the skin of grapes and in the oak barrels in which some wines are contained, and they give red wines their color and affect the taste. Tannins are also found in foods such as almonds, tea, and dark chocolate. “Hard” tannins will give the wine a dry effect, while “round” or “soft” tannins give the wine a chewy texture. Think back to when you smelled the wine: does the flavor intensity match the aroma intensity? Does it taste weaker than it smells, or vice versa? Try to determine what key flavors you notice. Like the identification of aromas, this part is challenging, but it will get easier with practice. In addition to fruit, do you taste pepper, vanilla, licorice, currants like in some reds? Or how about citrus, apples, honey in a white wine? Maybe you’re getting a buttery taste in a Chardonnay if it’s gone through malolactic fermentation. 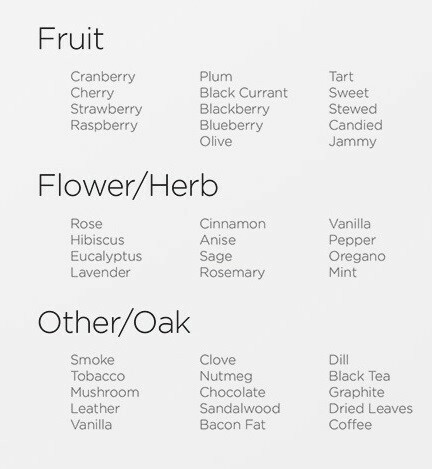 Reference the aroma charts above to also help you identify what flavors you’re tasting. Make a note of the “finish” of the wine after you have swallowed or spit into a bucket. How long does the flavor linger in your mouth? Typically, the longer the flavor lasts in your mouth, the better the quality of wine. After you’ve completed your full analysis on the wine, give the bottle an overall rating and take some general notes on what liked and didn’t like. For my overall ratings, I prefer to use a 5-star system to keep it simple, but you might prefer using a percentage system or something more detailed. Overall, tasting wine this way really helped my husband and I think about wine in a new light, and improved our wine vocabulary so we could describe wine in more ways than “I like it” and “I don’t like it.” I especially started to appreciate wine more when I was able to identify flavors and make distinctions between different bottles. I hope this guide proves to be useful next time you are trying a new wine and more importantly, I hope it encourages you to try new wines!